Parliament was on Thursday cordoned off from the public following reports that there were plans to disrupt the debate over the contentious security laws. Anti-riot police drawn from the General Service Unit (GSU), regular and Administration Police kept vigil along all the roads leading to Parliament. The security personnel, ready with tear gas canisters and police dogs, patrolled Harambee Avenue and Parliament Road to keep away protesters. Some of the officers formed a wall near the President’s and Deputy President’s offices and directed the public to use alternative routes. Journalists and those authorised to access the premises were thoroughly screened as MPs opposed to the passage of the Security Laws (Amendment) Bill engaged the ruling coalition. About seven people who attempted to publicly declare their disapproval of the Bill were arrested as the hawk-eyed security personnel questioned everyone who dared move close to Parliament. Members of the civil society who had planned to stage protests against the Bill had no option but to watch the unfolding events from a distance. Cord Members of Parliament protest against the passing of the Security (Amendment) Bill 2014 outside Parliament. 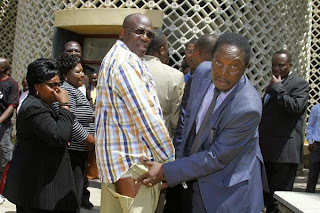 At one time, one person suspected to be a police officer in civilian clothes was arrested near the entrance of Parliament after he was allegedly overheard by his seniors discussing the merits and demerits of the Bill. Some Cord senators monitored the proceedings on television screens next to the entrance of the chamber before opting to move to the Speaker’s gallery. However, Speaker Justin Muturi ordered that the five senators be ejected from the gallery when chaos ensued. Senators Moses Wetang’ula (Senate Minority Leader and Bungoma Ford-K representative), James Orengo (Siaya, ODM), Janet Ong’era (nominated, ODM), Boni Khalwale (Kakamega, UDF) and Johnson Muthama (Machakos, Wiper) declined to leave. They remained seated in the gallery even as the House was adjourned for 30 minutes in an apparent attempt to allow members who had become rowdy to calm down. Mr Wetang’ula said the Speaker’s directive to have them thrown out of the gallery was misguided and an abuse of power. “We are MPs and have a right to sit here and follow the proceedings. If the Jubilee Government is watching the proceedings then it should immediately withdraw this Bill. We do not want anybody to impose anything on Kenyans,” he said. In reference to the contingent of police on guard around Parliament, he said it was unfortunate that the Jubilee administration was already implementing the proposed law before it was passed. “That is why they have cordoned off Parliament. If anyone is in doubt of how a police state will look like, you can see the dress rehearsal today around Parliament. The recreation of a police state is way underway under the Jubilee regime,” said Mr Wetang’ula. He, however, said that Kenyans would not be cowed by the presence of security personnel to keep silent when the Constitution is being mutilated in the guise that the government was fighting terrorism, by sneaking mischievous legislation into the Bill. “We are not going to watch this happen. We have people who are ready to face bullets. We stand here today ready for whatever consequences because we are on the side of history; we are on the side of Kenyans, fairness, justice and truth,” he said. Mr Muthama said there was no justifiable reason for the government to deploy such a contingent of police to man Parliament. “There are no terrorists here. This National Assembly is a public place where members of public can come and listen to what their leaders are saying,” said Mr Muthama.